Nutrition is the supply of materials – food – required by organisms and cells to stay alive. Nutrients include proteins, carbohydrates, fats, vitamins, minerals, and water. However, in hospitals, nutrition refers to the food requirements of patients, including nutritional solutions delivered via an IV (intravenous) or IG (intragastric) tube. A healthy diet may help to prevent certain long-term (chronic) diseases such as heart disease, stroke and diabetes. It may also help to reduce risk of developing some cancers and help to maintain healthy weight. CIMS dietary department takes care of every patient admitted in the hospital and are assessed for their nutritional needs as per their disease to identify their nutritional requirements on daily basis. Our dieticians take care of the patients by preparing diet plans for the rehabilitant patients, counseling patients and their relatives for their dietary intake and advising them about the food-drug interactions. The department ensures that food is prepared and served in a safe and hygienic manner. We provide services according to their dietary needs as well as we educate the patient on various diet related activities. We follow Indian Guidelines for Recommended Dietary Allowances. The primary aim of screening is to get a rough insight into the patient’s nutritional status and food preferences. Nutritional Screening is done immediately after patient’s admission but within 24 hours of admission of the patient. Out-Patients also get advised about nutrition, as and when needed. Dietician checks nutritional intake before visiting the patient. A feedback from the nursing staff and relatives of patients provides the necessary clinical basis to plan further feeds/ liquids. Clear Liquid:Diet in which milk, thick soups and thick juices are avoided. Full Liquid Diet:In which all types of juices, milk and milk products, soups are included. The patients on liquid diets and tube feeding are monitored on a daily basis. Biochemical parameters like blood glucose, serum creatinine, serum proteins and electrolytes levels are checked and diet plan is modified accordingly. Nutritional evaluation of the patients on tube feeding in the critical care units is done wherein the patients tolerance and acceptance of the feed is checked. In the Ryle’s Tube Aspiration (RTA) for 24 hours, biochemical parameters are noted and modifications are made accordingly in the liquid diet plan. For patients, on tube feeding the aspiration level is monitored on a daily basis and the caloric density of the feed is then increased / decreased accordingly. Soft Diet:It contains very soft food and is easily digestible for the patient. Patients whose intake are inadequate or are unable to eat a large quantity at one time are provided with additional liquids or an additional mid meal snacks. Full Diet:It consists of balancing nutrients consisting of cereals, pulses, fruits, green vegetables and limited amount of sugar and oil. Certain dietary modifications will be made as per the patients’ eating habits, preferences and disease condition. Special consideration is provided to patients with religious beliefs. Food choices are given to International patients considering their condition of disease and availability of materials. Low Fat and Low Fat-Low Cholesterol Diet: This type of diet is recommended for CVD (cardiovascular disease) patients specially with high cholesterol level and obesity as risk factors, along with hepatic dysfunction. As recommended by Indian Council Of Medical Research (ICMR), the visible fat should not exceed more than 25 gm in a day or in percentage it should not exceed 20 -35% of total calories. Animal fats such as whole milk and milk products should not exceed more than 10% of total calories. Anti Diabetic Diet: This diet is calories and protein specific recommended for subjects with blood glucose above 130 mg/dl in fasting condition and 180 mg/dl in post prandial condition. It excludes simple carbohydrates like sugar, honey, jaggery, mango, banana, fruit juices, coconut water, chickoo, plain rice, potato and sweet potatoes. It includes complex carbohydrates like rice with vegetable combination or cereals and pulses in combination. Also, frequent meals are advised to maintain glucose balance in the body of these subjects. Low Protein Diet: This diet is often prescribed to patients with kidney or liver dysfunction. A suggested acceptable level of protein in a low protein diet is about 0.6g/kg of body weight per day or about 40-50 gms/day. High Protein Diet: It is often recommended to build muscle and loose fat. It is also advisable for ICU and trauma patients. Recommended value of protein for a normal person is 1 gm/ body weight. In case of high protein diet, it can be 1.5-2 gm/ body weight. Renal Diet: Recommended for patients with renal dysfunction. Generally foods high in potassium, phosphorus, salt and protein like palak, methi, tomato, coriander leaves, coconut water, fruit juices, papad, pickles, raw vegetables, raw fruits (except papaya and apple), whole pulses, etc. are restricted. 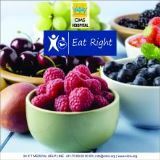 Over all, CIMS provides low fat low cholesterol diet for all patients which changes from time to time as per requirement. The dietitian may modify the diet as per his/her discretion after discussing the case with the clinician.